A Second Zytek LMP1 Hybrid For Le Mans? It’s still only mid-February, but suddenly we’re into a very interesting period as regards potential prototype entries (and developments) for 2006. The company’s guaranteed entry is the Essex Invest car, for John Nielsen, Casper Elgaard and Philip Andersen. But everything is moving forward with the intention of having Johnny Herbert and Guy Smith, plus TBA, racing a second Zytek hybrid in June. The next group of accepted entries will be announced later this month, the final group at the end of March. With 2006 being the final transitional year between the old and the new regulations at Le Mans, this year’s event is building up to be at least as interesting as the 2005 event. Two four litre Zytek hybrids would add to the appeal of the LMP1 Class immensely. Smith and Herbert last raced together at Le Mans in 2004, with Jamie Davies - the trio just failing to catch the Team Goh Audi R8 in their Audi Sport UK Team Veloqx example, after a minor rear suspension repair on Sunday morning. 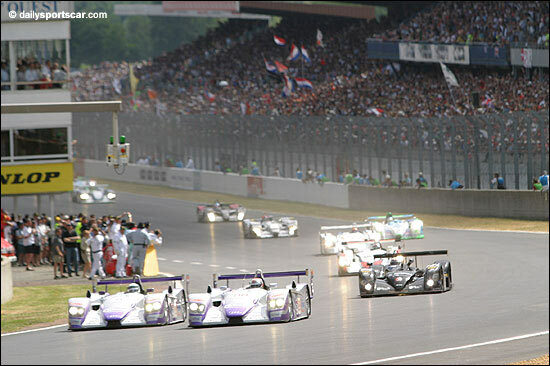 Below are Allan McNish, Jamie Davies and Andy Wallace (in the Zytek) leading the field at the start of lap 1 of the 2004 Le Mans 24 Hours.